Use Minecoins to purchase skins, textures packs, maps and more exciting content made by Minecraft community creators! Find new ways to play by visiting the in-game Minecraft Marketplace, where you'll discover a constantly updating library of exciting new Minecraft content - from a community whose imagination knows no limits! 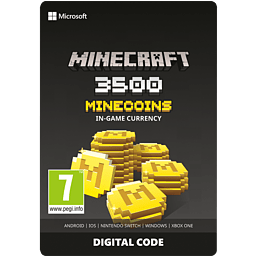 Once you've redeemed your Minecoins, they'll be linked with your Microsoft account, so you can access your coins and purchases through all of your supported devices that run Minecraft*. *Minecoins require a version of Minecraft with Minecraft Marketplace. Platform exclusions apply. Visit minecraft.net/minecoins for more information.